Basic ingredients: Founded in 1981 in tree-filled grounds, The Grange enjoys a worldwide reputation. A countryside school run since 1988 by Jane Averill, who has a background in farming, with her Australian husband Will joining her in 1995 after they met when he was a student on the Essential Cookery Course. Two roomy, light and well-equipped kitchens provide the location for making the most of home-grown wholefood ingredients. The four-week residential course was the first of its kind in the country. The latter edition is Food with Flair – a five-day ‘more relaxed’ holiday offering. Class sizes go up to 24 but teacher-student ratios are high. They Say: We believe passionately in ‘bringing the outdoors in’ – we use flowers, herbs, salads, fruit and vegetables from the garden as much as we can. The Grange is always fresh and continually evolving. We Say: A school with pedigree. Nourish the soul, the palate and the mind in rural surroundings. 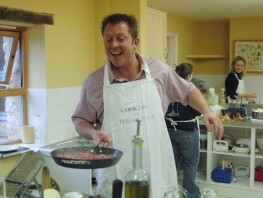 The Essential Cookery Course is for the professionally motivated so be prepared to be put through your paces. There are assessments to ensure the information goes in.